When we first got into raw foods and healthy living, it didn’t take long before we realized that Norway was not the best place to live if we wanted optimal health. We recognized that humans originated in the tropics, and that’s also where the best fruit’s going to be. We packed our bags and embarked on a journey without a final destination. Over the past five years, we’ve lived as modern nomads, moving with the seasons and following the fruit. 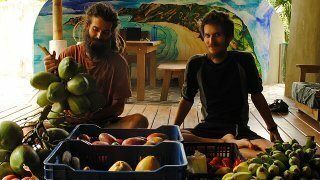 We are total fruit fanatics, and honestly, our main reason for traveling, other than seeking a better climate, is to eat fruit! Traveling together as brothers and friends has been great. We have a book out called The Way of The Fruitful Traveler, which covers our travel experiences in depth. It goes into the art and science of long-term travel, and it’s meant as a guide for anyone wanting to do the same. 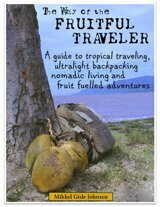 Topics such as lightweight backpacking, traveling on a budget and fruit hunting is covered extensively. 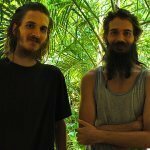 After a couple of years of traveling and getting to eat some of the best fruit on earth, we wanted to share our experiences with the world. Not only that, but we also wanted to spread the message of health, raw veganism, Natural Hygiene, fruit, optimal nutrition and how to live a happy and healthy life. We started our YouTube channel in 2014, and it’s been so much fun! The channel gives us a lot of purpose in life. Every day, we put in a few hours of work. It’s very rewarding to be able to share our ideas with the world. Helping people help themselves is probably the most satisfying thing we can think of! 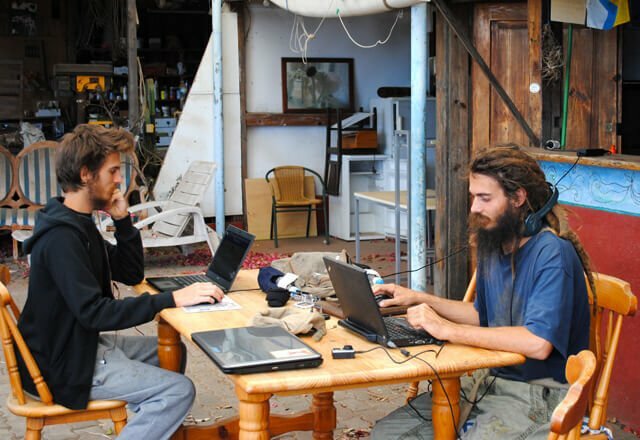 A day at the office: Mads (left) and Mikkel Gisle Johnsen work on laptop computers in La Palma, an island of Spain. In the beginning it was just the channel, and we aimed at putting out a video every other day. Eventually, we also built a website on which we offer coaching, books and information on health and nutrition. Mads does most of the technical and administrative work, while I, Mikkel, create most of the content. We both make videos. We’re now also on Patreon, where we offer exclusive content such as Q-and-A videos and monthly live hangouts for our patrons. Right now, we are doing very well, and we’re superexcited about where things are going. Our channel has 35,000 subscribers right now, and who knows how it will evolve. We work on inspiration, not obligation. In other words, most videos are made in the spur of the moment rather than being premeditated. A typical day of work might consist of editing videos, developing the website, scheduling and coaching clients via Skype, posting videos on YouTube and sharing them on Facebook, answering comments on posts, answering e-mails from people seeking advice on health, the fruit diet or traveling, working on new e-books and lots of other small details. It’s all fun! Our work ethic is to work as hard as we feel like, when we feel like it and never do anything we don’t want to. In other words, we lead the perfect life! We don’t take things seriously—but we are sincere! Our best tip for success on YouTube, in business or life in general, is to be consistent. A little bit every day goes a long way! We’ve made a lifestyle for ourselves that’s sustainable. We’re not overworked, but we’re not underworked either! We have plenty of time and flexibility to pursue our passions in life, and they may change from day to day, week to week and from one year to the next! Change is constant, and we try our best to embrace that! Who knows what the future may bring? 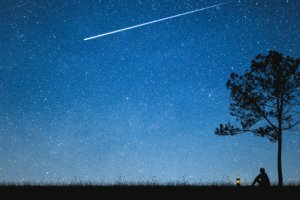 Follow your highest excitement, at all times, to the best of your ability, without fear or expectations as to what the outcome will be—and your life will become an ecstatic explosion of bliss. One of the most important things I’ve realized over the years is that making dietary changes will never be successful if it’s about restriction. It has to be about abundance. I’ve never been a very disciplined person, but I have always had a lot of passion, and when I’m inspired about something, I go all in. This is true for everything I do. I pursue what I’m passionate about. Growing up, I guess I ate semi-healthfully. Our mom would cook for us every day, so we didn’t grow up eating processed junk food, but the composition of the diet was still not the best. In my teens, I started getting inspired about a vegetarian diet after being exposed to various sources like Eastern philosophies and roots reggae music, whose lyrics often promote a natural diet and lifestyle. 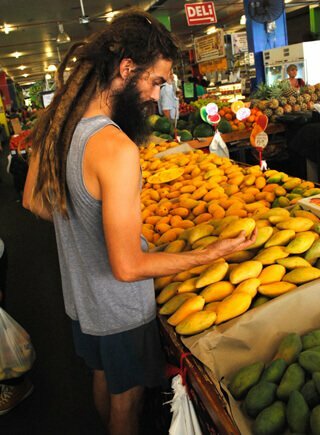 Mikkel Gisle Johnsen shops for mangos at a fruit stall in Cairns, Australia. When I finally went to Jamaica at the age of 21, I decided to take the leap. I was inspired about getting healthier—as well as the idea of eating a more ecologically sound diet that would benefit myself, the planet and the animals. I was trying to cultivate more compassion and peace in my own life, and I couldn’t see how I could do that and continue eating tortured and dead animals! My days as a walking cemetery were over, and I embraced the vegetarian lifestyle with passion! My health did improve after cutting out meat. There’s no doubt about that, but it wasn’t until I made the decision to go 100 percent vegan four years later, in 2011, that my health really skyrocketed. At that point, I had gone for several years knowing that eating dairy products and eggs was neither healthy or ethical in any way, shape or form—but I was too addicted to it. I couldn’t stop eating cheese! I remember having this feeling of discord within myself whenever preaching the benefits of vegetarianism while still eating animal products. One night, I saw a YouTube video about how the calf is taken away from its mother in order to steal her milk. That was it. I could not stand to take part in any of these abusive, exploitative and disrespectful practices any longer. I woved to go 100 percent vegan from that point onward, and I still am. Fruit: It’ll be durian for taste, but if I had to choose one fruit, it would be mango. Book: Why We Run by Bernd Heinrich. Film: Too many. Here’s three: Timecrimes, The Island, all of James Bond! Album: Ras Mek Peace by Midnite. Thing to do: Whatever is most exciting in the moment. My health rapidly started improving, and excess fat and water weight disappeared by the day. My energy levels increased. I started walking everywhere instead of taking the bus. I felt superexcited. Just a few months later, I left London, where I was studying audio engineering at the time, and came home to Norway. That summer was one of the biggest turning points in my life! I saw everything in a new light! I recognized that there must be such a thing as the ideal human diet! All the animals are eating their natural food, living their lives as part of a whole—what’s our place in all this? What’s our natural food? From there on, things happend quickly. I started paying attention to how I felt after eating certain foods, especially how I felt the next day. I noticed that on the days when I just ate fruit or salad the night before rather than cooked grain products with lots of oil, I felt amazing! I found Dan the LifeRegenerator McDonald on YouTube and could not help but become utterly inspired and excited about raw foods! I bounced ideas off my brother, Mads, and together we pretty much went from eating mostly cooked foods to an all-raw, fruit-based diet within weeks! We constantly inspire each other, and I’m not sure things would have played out exactly the same if it hadn’t been for the fact that we did this together. The funny thing is, we never actually decided to “go raw” in the conventional sense; we just found ourselves preferring to eat fruit, constantly putting the pizza dinner on hold in order to “have one more day of feeling epic.” We were on a roll. Like I mentioned earlier, it was never about restriction for me. It was never about what I “couldn’t have.” It was about how absolutely awesome fruit was and how utterly abundant my life became once I started including more raw fruits and vegetables into my life! I didn’t exclude anything! I just included so much fruit that there wasn’t room for anything else! Since then, I’ve refined my diet and lifestyle further and have never been afraid of experimenting. When I first started out, I didn’t understand calories and how much food I was required to eat in order to be satiated and have the energy I needed, but soon enough I found Harley “Durianrider” Johnstone on YouTube. His teachings along with the fact that he led me to Doug Graham’s work enabled me to quickly get a handle on exactly how to eat a high-carbohydrate, low-fat raw vegan diet—and succeed on it. Mikkel Gisle Johnsen holds fruits up high. Another of my main realizations, after learning to eat enough fruit, was that I did much better on all fruit rather than when I included vegetables. I didn’t enjoy eating greens one bit, and I didn’t like the way I felt after eating them either. I spent almost two years battling the fear of not having greens in my diet before I eliminated them completely. Without getting too deep into this issue, what I will say is this: I can find no nutrient missing from a diet of ripe, tropical fruits. If we indeed needed to eat greens, from a biological and nutritional standpoint, I trust that we would have a natural urge to do so, but my experience is that I never want greens and when I look at everyone else, they are all pouring dressings over their salads, and that tells me they are not too into their greens either—even though they may say so! The issue of sodium is the only one I’m still pondering when it comes to greens, but I’ve found coconut water as well as many tropical fruits to be excellent sources of this electrolyte. Depending on where I am in the world and what fruit is available, my diet changes over the course of the year. A typical day in the tropics might look something like this: I wake up and have some water first thing. I drink according to thirst, and it’s rarely more than a liter, usually around half. After some running, I’ll have the water from one or two young coconuts. Then I might eat a few kilograms of papaya for breakfast before I “get started” with my day. Lunch is usually a big meal of bananas and the water of a coconut or two again. Sometimes I might prefer eating mangos for lunch or maybe cherimoyas if they are available! For dinner, I rarely enjoy bananas. Usually, I’ll have mangos for dinner followed by the meat of one young coconut or maybe an avocado. If I’m hungry again before bedtime, I might have some dates. That’s pretty much a typical day for me in the tropics. After almost four years of eating 100 percent raw 100 percent of the time, my diet today is more like 100 percent raw 50 percent of the time and 60 to 70 percent raw the other 50 percent of the time. Wow that’s a lot of percentages! Let’s put it like this instead: The majority of the calories I consume in the span of a year, comes from fresh fruit in it’s ripe and raw state. I’m eating what I would call a fruit-based diet. The reason I sometimes eat foods that are not raw is simply because there are times when I find myself in locations where the fruit quality simply isn’t good enough. I eat fruit out of preference because it makes me feel amazing but also because it tastes better than anything else! There’s no doubt in my mind about fruit being the one and only perfect food for humans, but I also have to stay realistic when it comes to the consequences of living outside the tropics. When I find myself having to endure my meals rather than enjoy them, I’d rather eat something else, even if it’s a little less ideal nutritionally. I remember eating dried figs for dinner on a daily basis in Norway at one point after a day of all bananas. I wanted to “stay raw” and “stay fruitarian,” and I did, but I wasn’t enjoying my dinner one bit. After opening up for the inclusion of some other foods at times when the fruit available wasn’t satisfactory (both in terms of calories and enjoyment) I’ve been able to find compromise I am happy about. I consider conservatively cooked (steaming and boiling) roots and tubers such as potatoes and sweet potatoes the second-best option after fruit. I don’t make recipes. I don’t buy processed or packaged food. If I am going to cook, I stick to “whole foods,” cooked as they are, eaten as is. During the day, I will still eat all fruit, usually bananas. Speaking of bananas, I’ve come to the conclusion that they are indeed the most important fruit for anyone eating a fruit-based diet. They are available everywhere, reasonably priced and, most importantly, are consistent in terms of calories. You can rely on your bananas to supply you with exactly what you need, when you need it. Most fruits tend to be quite inconsistent in terms of their caloric sufficiency and thus “satiety value,” but the banana delivers. Every time. As a matter of fact, I just wrote a book about bananas. As for fitness activities, I was very active as a child and teenager training in Taekwondo, but after I stopped doing that at the age of 20, I lost a lot of what I’d gained. It wasn’t until I started eating fruit and got interested in the science and art of health and healthful living that I once again started cultivating my fitness. After changing my diet, I now had energy levels I had not experienced ever before! I didn’t have to motivate myself to exercise. It was just a natural urge. I had to move. Over the years, I’ve done a lot of walking for pleasure, biking for transport and sometimes I’ve also gone to a gym regularly, but my passion lies in running. I’ve enjoyed running intermittently over the past few years, but due to constantly traveling, I haven’t been able to cultivate it as consistently as I would like to. That’s changed now though, as I’ve decided to put my heart and soul into it and see how far I can go! (Pun intended!) When you get enough sleep, sunshine and rest—as well as eat the diet for which you are biologically adapted—being active is simply a matter of enjoying your natural abilities and having fun! I’m as excited about a fruit-based diet today as I was when I first started. The only food that appeals to our senses in its raw natural state is fruit! Nutritionally, it’s complete. There’s no need for tools. It’s delicious as it is. Fruit is human food, there’s no doubt about that. 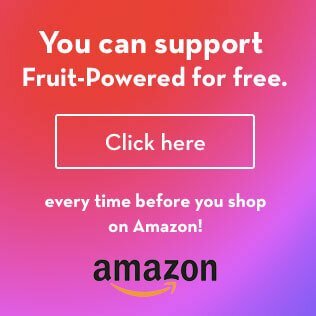 If you have made it this far in the article and are excited about fruit, I’d highly recommend you give it a try in your own life. Chances are, the results will speak for themselves and motivate you further. Don’t hesitate to contact me for advice through our website at any time, and remember to check out our e-books on fruit and travel—as well as our free videos on YouTube! Have an awesome day! I distinctly remember a specific situation in which I was going to make some lunch and grabbed for the bread, and Mikkel said, “You know, bread isn’t really that healthy either.” At that point, I knew there was no turning back. I had stopped eating meat, dairy and eggs. Grains were the next thing to go! 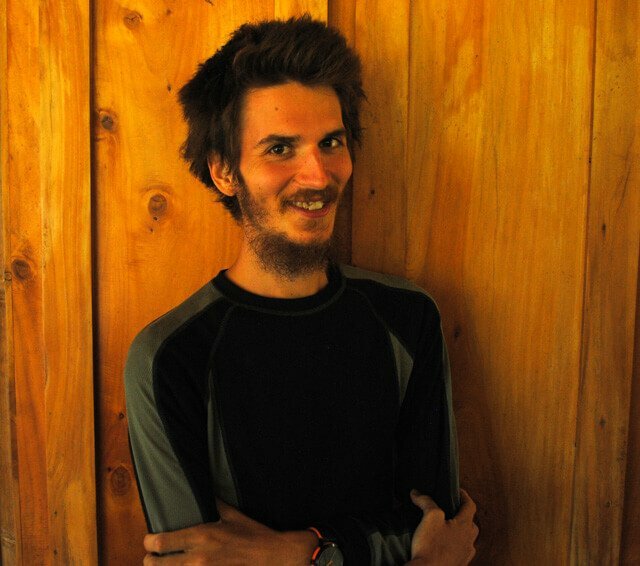 Mads Gisle Johnsen is photographed before adopting a raw vegan diet. When I was very little, I used to eat anything! When I was about 6 years old, however, I started becoming more and more limited in the way I ate. At 9 years old, pretty much all I ate was french fries with ketchup and bread with nothing but a specific MSG spice mix called Gastromat. I was disgusted by almost all other foods! Every year after that, I started liking perhaps one more food item such as chocolate, minced meat, pizza (without cheese, which I started eating at age 16). I wouldn’t take a single bite out of anything that resembled a vegetable or fruit. I would literally get nauseous if I tried. Over the course of about 10 years, I had probably eaten something like one fresh lettuce leaf and a quarter of an apple. After high school, however, things started changing rapidly! I started studying religion, which made me look at human nature and our connection to the world in general. One thing led to another, and before I knew it, I, Mads, the french fries-eating video gamer (70-plus hours of gaming per week) became a vegetarian! The funny thing is, I still didn’t eat any fresh vegetables or fruit! At that point, though, as I became more inspired about fruits and vegetables, I actually started enjoying them. It’s all about inspiration. Fruit: Best tasting? Durian. Overall favorite? Mamey sapote! Exercise: See the world, have fun and get from “A” to “B” quickly! Book: A Song of Ice and Fire by George R.R. Martin (A Game of Thrones). Film: Difficult! Probably Pan’s Labyrinth. Album: Boondigga and the Big BW by Fat Freddy’s Drop. Place on earth: My home in Norway or my “second home” in Nice, France. Thing to do: Play video games, listen to audiobooks and eat! Mikkel probably played a huge role in inspiring me on vegetarianism. I liked the idea about becoming healthy and not harming animals. I started identifying myself very much with the whole thing. The truth, of course, was that I still wasn’t very healthy even though I had cut out meat. I ate lots of dairy products and a lot of oil, which I thought was very healthy at the time. It wasn’t until spring 2011 that I took the huge step of removing all animal products from my life. Now that had some more profound effects on my body. At the time, I weighed about 79 kilos (174 pounds) (179 centimeters, or 5 foot, 9 inches), and was doing close to no exercise. 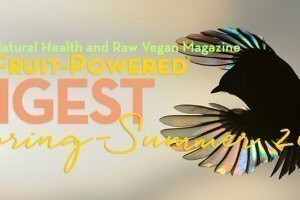 Turning vegan, I started shedding the unnecessary fat quickly. Obviously, I was undereating, but it felt great at the time. I was done with the days of going to bed feeling terrible after having eaten 300 grams of chocolate and a huge bag of chips. The weight loss made me feel more energetic, and before I knew it, I had lots of activity in my life. Me and Mikkel were biking all over town, drinking green juice, watching Dan the LifeRegenerator on YouTube and being superecstatic about life! Over the course of half a year after me and Mikkel turned vegan, we both started implementing more uncooked food into our diet. Juices, salads and smoothies were being consumed after being inspired by Dan the Man and “Durianrider,” among others. For the first time in my life, I felt like I could actually do the things I wanted to do. I felt absolutely awesome and knew I was doing the right thing. We read Doug Graham’s The 80/10/10 Diet only a couple of years later, but we were already following the principles of the book by simply following what the body was telling us. My diet became more and more simplified as the years went by to the point where I was eating only monomeals of fruit with the addition of small amounts of overt fats when I had a tasty source available. 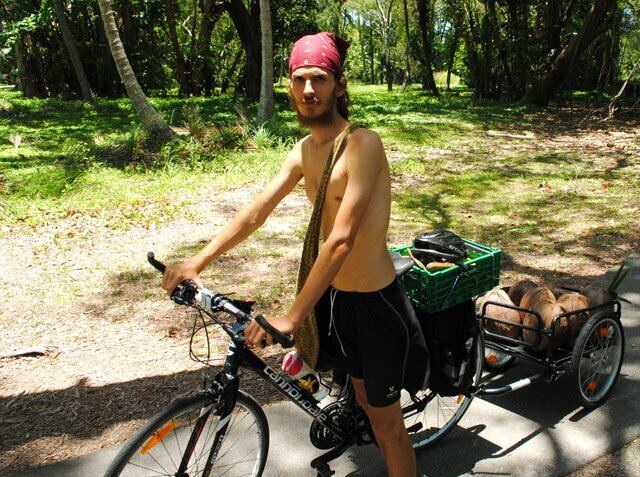 Mads collects coconuts while riding a bicycle. Me and Mikkel started traveling together at the end of 2012. It was a great eye-opener, especially in terms of the fruit quality different parts of the world had to offer. 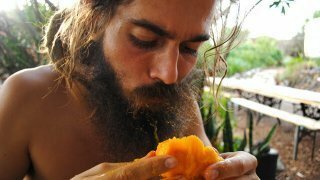 This was how I truly learned that fruit can by itself be a sustainable, healthy food source. High-quality fruit is paramount to success. We’ve been to Thailand several times as well as Australia and the Canary Islands. We’ve also been to Costa Rica, Bali and Penang. Seeing and trying all the different fruits has been awesome, and traveling with my brother has been great as well. Our relationship has become very strong, and we’re living very similar lives today because of our travel experiences. Having someone to travel with and share your experiences with, as me and Mikkel have, is, I think, a big factor to our continued success. Today, I’m living the most awesome life I could possibly imagine living. Most of my days are mostly like this: I wake up after a long refreshing sleep, do my morning stretching routine while listening to audiobooks, head out on some adventure with my bike or legs, work on my computer for a couple of hours and then come home and do random stuff before dinner, which is followed by relaxing in the evening. I definitely do most of my exercise as part of my daily life. I like biking to different locations to do my work for the day. That being said, I do a kind of active stretching-yoga-strength-aerobics workout for almost an hour every morning. I love it, and it definitely contributes to my having a very flexible and increasingly strong body. I’ve come to realize more and more that exercise makes me feel great. Rest feels better, food tastes better, my focus is improved, and I’m happier overall! It’s all about finding something that you enjoy to do! As for the future, who knows? I certainly don’t! Both me and Mikkel don’t really make much long-term plans, but we usually think ahead a few months on where we should go when winter comes around in Norway. There will certainly be more traveling over the years, whilst continually making videos and other content for our ever-growing YouTube channel. It’s a very, very satisfying way to live, and I can’t see it changing much over the next years. Mads is photographed while in Costa Rica. 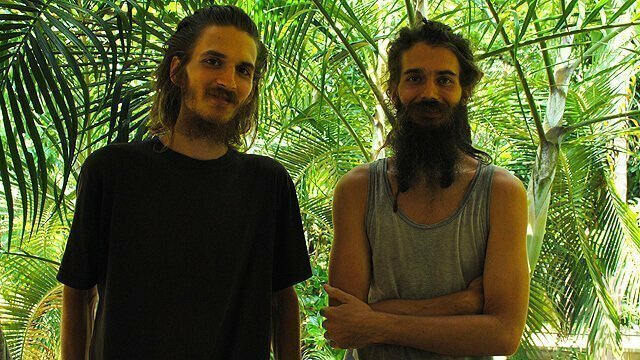 Mikkel and Mads are the brothers behind Sweet Natural Living on YouTube. They love to entertain, educate and inspire people about healthy living and a fruit-based diet. 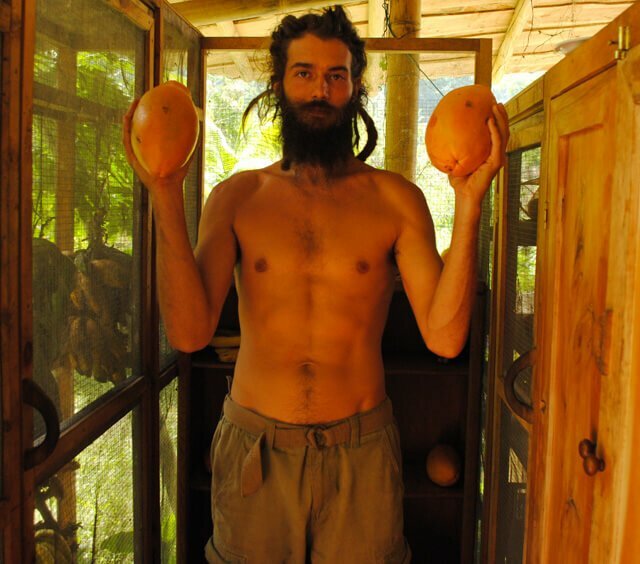 You guys have been a true inspiration to me and I guess many-many others around the world in switching to or at least trying the fruitarian lifestyle. I especially value that the way you talk about this lifestyle and diet is so natural and so un-intimidating. When I look at some (no, most) of the other sources online, they can be quite bossy and strict about what is 80/10/10 and what is not. Whereas you guys just go with the flow and take it easy – which is exactly the approach I also embrace. 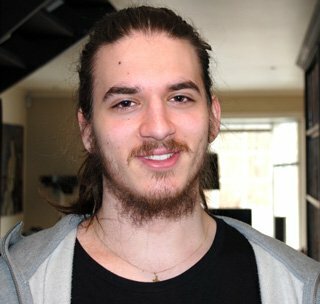 Brian, thank you for giving them the platform to share their experience, what a great and detailed article.